Azzurra, the Italian boat with the old name and the young crew, defeated Britain’s TEAMORIGIN in the closest of four hard-fought races on the opening day of the Louis Vuitton Trophy Auckland. Italian skipper and helmsman Francesco Bruni snatched a victory from Britain’s three-time Olympic gold medallist Ben Ainslie at the first weather mark of their race as their boats rounded the mark overlapped. Sailing above the mark, Ainslie tried to luff his opponent only to see the Italian execute a swift spinnaker set, sail clear and go on to win. In their efforts to stay on schedule, the race committee spent a long first day on the water. In the morning, cloudy skies killed any chance of a sea breeze developing and delayed racing. The Rangitoto Channel entrance to Auckland Harbour was so glassy at late morning that Principal Race Officer Peter Reggio joked that it appeared to have been paved. Race One: All4One def. Mascalzone Latino Audi Sailing Team, 00:44 – In the draw last night, the German/French boat All4One chose the starboard entry for the start and they protected the right side in the pre-start today. 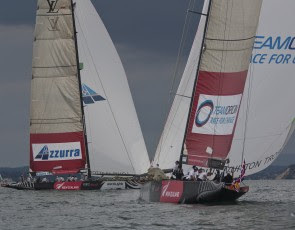 They split before the gun with All4One going out to the right on port tack, while Mascalzone Latino Audi enjoyed an early lead on starboard. All4One skipper and strategist Jochen Schümann said a man up the mast had spotted wind out to the right and they chose to concede an early lead to reach the stronger pressure. All4One eventually tacked to starboard to cover and Gavin Brady steering the Italian boat initiated a tacking duel. However Sébastien Col on the helm of All4One had already worked out to a controlling lead on the right that he never relinquished. Race Two: Azzurra def. TEAMORIGIN, 00:53 – Great Britain’s TEAMORIGIN enjoyed the starboard entry in its match against Italy’s Azzurra and used it to advantage in a dialup that took both boats well above the line before they sailed back with Ben Ainslie on the British boat chasing Italian Francesco Bruni. Ainslie grabbed the right as they split away at the gun but Bruni kept it close and when they crossed for the first time Ainslie on starboard came down and hunted the Italian who tacked close to leeward and forced the British boat away. It happened again before they came into the weather mark overlapped, with Ainslie holding his opponent out from rounding. They tacked above the mark and the British boat luffed the Italian until Bruni capitalized on a miscommunication on Ainslie’s boat. Bruni was first to set a spinnaker and rolled over TEAMORIGIN forcing the British boat to gybe away. From there the Italians controlled the next three legs, finishing with a comfortable 53 second margin. Race Three: Emirates Team New Zealand def. Artemis, 01:40 – Dean Barker overcame the handicap of a port entry in the pre-start to grab the right side of the course off the start line. Strong outgoing current and shifty breezes played a major role as Terry Hutchinson steering Artemis took the fight to Emirates Team New Zealand but trailed by 55 seconds at the weather mark. Artemis came charging back on the run to close within 12 seconds at the leeward gate but then lost ground in lighter air under North Head. The Kiwis extended to win comfortably. Race Four: ALEPH Sailing Team def. Synergy Russian Sailing Team, 03:26 – The Russian boat steered by Karol Jablonski dominated Bertrand Pacé’s French entry in the pre-start only to see ALEPH wriggle clear and lead by three boat lengths at the gun. Jablonski kept it very close, pressuring Pacé on the first beat and was only 11 seconds astern at the top mark. As the sun set over the Auckland City skyline it was also sunset for the Russians as they ran over their spinnaker at the leeward mark. The French sailed away to a comfortable victory. LIVE Sport Sailing 103.0 FM is featuring all-day live coverage of the Louis Vuitton Trophy. On television, during the seven days of the round robin, TVNZ is carrying nightly reports on its sports news. From March 16, during the elimination rounds, TVNZ will feature nightly half-hour reports. For the finals on 20th and 21st March there will be live coverage of the racing from noon to 4:00pm. Live streaming web coverage of the Louis Vuitton Trophy in Auckland is available on the event website, www.louisvuittontrophy.com. The official site (in English, French, Italian and Russian) is also rich in team content, as well as features, audio, video and images.